Seven Signs That You're a Shy Extrovert - Lately we've been much talk about introvert, now I want to write something about extrovert. A simple one about another side of extrovert. An extrovert character is described as a person cheerful, sociable and loud voice. Extroverts are usually the center of attention in crowds and really liked to be the center of attention. Who would have thought, it turns out there are you know people shy extrovert, but theirself did not realize it! 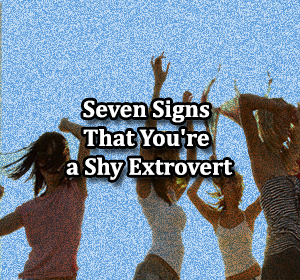 quoted from idntimes, here it is seven signs that you're a shy extrovert. 1. You do not like to be the center of the crowd. You love to meet new people, you like to chat and have fun with people. But you never want to if a major star in the show, and would prefer to be 'ordinary people'. 2. You will always be a good listener. Typically, extroverts will dominate the conversation, he even wanted to talk continuously without stopping. However, you understand when to speak and when to listen to the conversations of others. 3. You can keep a secret well. Very few people who are willing to share the secrets for extroverts tend not to keep secret and tell it to everyone. However, you can keep a secret very well even though you burble-burble with many people. 4. You never forget old friends. As number one said that extrovert love to meet new people, but extroverts tend to be too eager to forget about his old friend when meeting new friends. But not so with you. You still remember old friends and say hello to them. 5. You still shy when speaking in public. You're so clever when talking with your friends, and even tend to be the most fastidious. However, you lose your ability when asked to forward to speak publicly. Not insecure, too! You just shy just because it was not used. 6. You could only close to certain people only. Indeed, you look so open, but actually you choose exactly who is really able to become a good friend. Not every people around you get your trust, they have to try to get it. 7. Even you want time alone to rest yourself. Although you seem always a story, sometimes you want to have fun or jumping own in your private room, while listening to the songs you like. You need time off as an introvert. However, in a different way.